I’m not the biggest fan of Topps 1972 Traded sub-set. To be honest I never liked them. 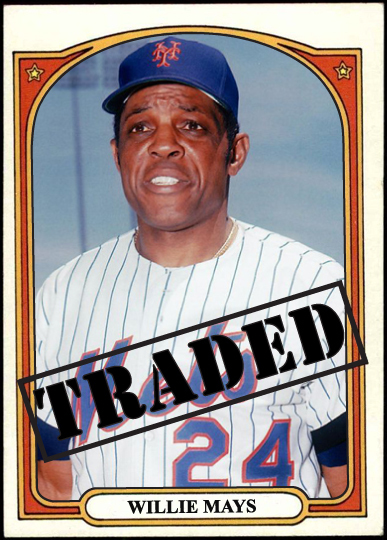 However I always wondered if Topps could have squeezed out a Mays version since he was traded to the New York Mets in May of the 1972 season. I don’t know the print-schedule for the series regarding the 1972 set, but it must be pretty close, no? Nevertheless, as we all know Mays was traded back to where it all began for him, New York, for pitcher Charlie Williams and $50,000 cash. He’d end up playing through the 1973 season, even appearing in the World Series as his final action as a Major League player in a losing cause against the juggernaut Oakland A’s three-peat champions. By the time he hung them up, he finished with over 2000 runs scored, 3000 hits, 660 home runs and 1900 runs batted in, while being named to 20 All-Star teams and winning 12 Gold Gloves. Easily the greatest player of the last 50-years, if not ever. I so want that card! Was never crazy about that format, always reminded me of a Wanted poster. This is one of cards/players where it just looks wrong. Should have been a Giant until the end. It itself, it is a nice looking card but I agree with everything! I actually never cared for any of the traded series of the 70s. The '74 ones were particularly maddening with so many obscure players on it. The '72 cards were actually part of the set and very tough to get. Agree. Never liked this format, but how can you not like a Willie Mays card. You make the format look good. I've always been a big fan of the '72 Topps Traded cards. Why on earth would Mays be left out of that series, though? What dopes! It is likely the Mays transaction was too late to include something like this card. Additionally, all of the players included in the Traded subset were taken using Spring Training shots, whereas Mays was with the Giants at Spring Training. If I had to choose a traded set as the best (or in my opinion, least worst), it would be the '72 as the others just gave more reasons for crazy airbrushing efforts. At least the '72 traded set gives us our only look at Frank Robinson with an unadulterated pic in a Dodger uniform.